A Second Nvidia “Next Generation Performance” Chart has been leaked online which shows the performance comparison of Nvidia’s Upcoming 28nm based Kepler GPU’s against the current gen Geforce 500 Series cards. The Kepler based GPU’s completely dominate their predecessors with a performance gain of 1.5-2x. All GPU’s have been tested on the same setup which consisted of a Core i7 Processor clocked at 3.4Ghz and tested on Battlefield 3 at 2560×1600 res, Ultra Preset and 4xMSAA. Looks like the GTX 790 Dual chip card would even be faster than Sli’d GTX 590’s. 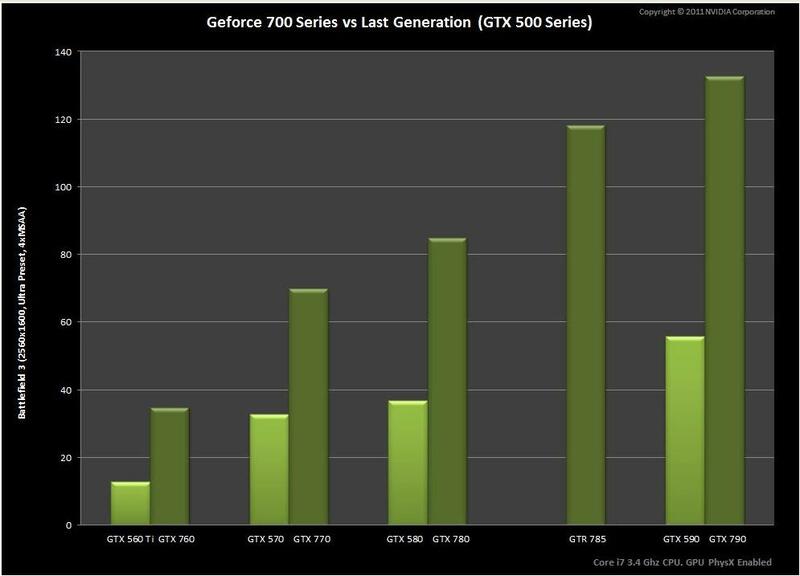 Performance gain of GTX780 and GTX770 is also 2 times the performance of older generation cards. The GTX760 doesn’t seem to be as fast as expected though its unknown if its based on the GK-104 core or GK-106, If this is the GK-104 performance then its pretty underwhelming considering it packs 670-768 Cuda Cores as reported by 3D Center however performance is nearing an Oc’ed GTX580 levels.